Full disclosure: I unapologetically love animated films. In fact, I belong to the group that categorically state that animated films are more for adults than kids. There’s always something for everyone. As Director Manikandan (of Kaaka Muttai fame) once said in an interview, talking about Kaaka Muttai, it isn’t necessary for the viewer to understand all the layers a filmmaker places in his film; there should be something even for someone who doesn’t look for subtext. I find this argument most relevant for animation films, which usually, and unfairly, get dubbed as ‘children films’. When you go beyond that facade, there are profound questions and seemingly simple answers. And Ralph Breaks The Internet, like its predecessor, is a rewarding watch on both counts. 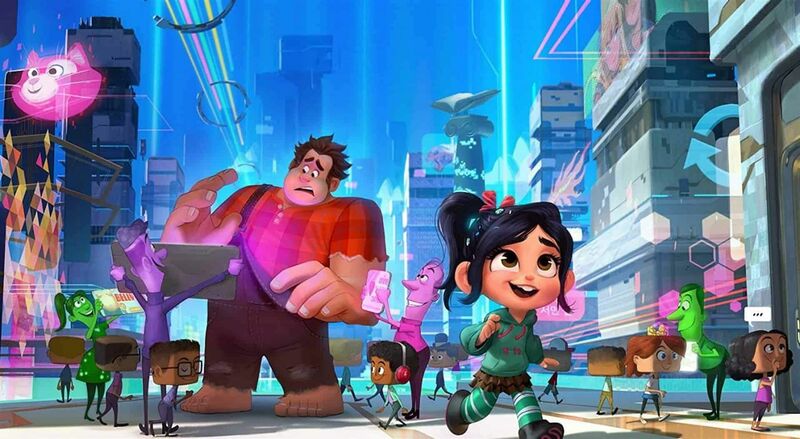 If Wreck-It-Ralph was about social inclusion, Ralph Breaks the Internet is about the insecurity that the age of Internet and social media has gifted us. The film begins at Litwak’s arcade, the location of all activity in the first instalment. After decades of isolation, Ralph, (a ‘giant’ misfit) has finally found a friend in the ‘glitch’ Vanellope von Schweetz. One might think, it is happily ever after; it is for Ralph. But Vanellope finds her predictable life, though pleasant, boring. She wonders if there’s more to life than this. And, an attempt to break that monotony leads Ralph and Vanellope into the glitzy, glamourous, big, bad world of the Internet. While Ralph Breaks the Internet has its cutesy humour and aww-moments in plenty, it still works as a story when you rip it of all its 'animation'. Set in the real world, it will be a story about two people, close to each other, who realise that it is okay to want other things; a tale where we overcome our apprehensions to venture into the unknown and to let our loved ones move away. The adult moments of Ralph Breaks the Internet are empathetic and profound, something that can almost be called a Pixar trait. More importantly, it is relevant. The film’s perspective into the world of the Internet beautifully marries fantasy with logic. There is an ‘insecurity virus’ that infects the Internet world. While the rest of the Internet sphere is densely populated, the comments section is unnaturally empty. When Wi-Fi enters the arcade, the security warns the characters to fear it as it is new. At the surface, it is just cute dialogues, but for the person looking for more, it hits hard. However, what I loved the most was Disney’s latest version of their own princesses. When Vanellope, a princess in her game Sugar Rush, gets to meet her fairytale counterparts, they are equally fascinated in each other. I laughed out aloud when a princess asks Vanellope if people assume her problems are solved when a big, strong man appears on the scene. That’s the defining question to determine whether Vanellope is a princess, and isn’t it apt! And they anoint Vanellope, ‘the queen of comfy’. How delightful it is to see our princesses out of their corsets and in t-shirts, saving the big and bulky Ralph in an iffy moment. On the other hand, Vanellope gets her epiphany when she ‘reflects’ and finds her song. It is a fascinating exchange of cultures. And when Ralph rips the corset himself (he accidentally finds himself in a gown), the film is also reflective of the changing male gaze. In fact, from being the clingy, overprotective father-figure to the more assured friend, the film is equally representative of new-gen guardians as well. Even without all this, Ralph Breaks the Internet is an enjoyable watch. There are cameos from some of our favourite characters -- Groot, Baymax, Buzz Lightyear and the late Stan Lee who is seen with Iron Man, to name a few. The humour is top-notch, as are the visuals. So if you feel I am reaching into the air too much with my interpretations, do not fret. After all, what did I tell you about animation films and what meets the eye?